This tumbler has a double walled exterior with a vacuum between the walls. This means your drink has no medium for the heat or cold to transfer through. Your drink will truly stay as hot or cold as possible. Even filled with ice or boiling water, the bottle will never sweat or get hot to the touch! Enjoy the protection and color that rugged powder coating adds to the tumbler. The powder coating is sleek and durable, making it the perfect travel companion. It makes a Birthday, Christmas, Valentine's, Mother's or Father's Day gift that will show off your excellent taste! This travel mug will keep your beverage the same temperature as long as possible and the clear lid makes it easy to drink out of on the go.Perfect for coffee, wine, cocktails, tea, champagne, beer, ice cream and more. ❤[304 Grade 18/8 Stainless Steel Material]-Made from 18/8 lightweight, lead free stainless steel that is top rack dishwasher safe and won't alter flavors or leach chemicals. 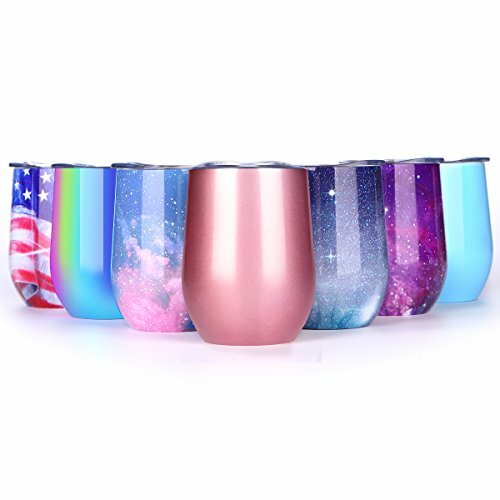 ❤[Double Wall Insulated Stainless Steel Wine Tumbler]- Will keep your beverage cold up to 9 hours and your drink hot up to 3 hours; By the pool, on the patio, at the office - wherever. ❤[Spill-Resistant-Lid Design]-Ensures that your drinks staying inside Stemless, not on you. Includes a removable silicone band for easy cleaning. The Lids designed to prevent it from spilling. ❤[Ergonomic Flat Sides]-Easy-grip sides ensure that Stemless stays securely in your hand. ❤[Offer A Gift To Remember]-Eye-catching, decorative and perfect for all hot & cold drinks, this 12 oz stainless steel tumbler will thrill the lucky recipient! Offer it to your little angel who just likes a tumbler cup "like mom's or dad's" or to nature lover and enjoy their ear-to-ear smile! It makes a Birthday, Christmas, Valentine's, Mother's or Father's Day gift that will show off your excellent taste! Spoil your loved ones with an irresistible 12 oz stainless steel tumbler with lid! If you have any questions about this product by NEWBEA, contact us by completing and submitting the form below. If you are looking for a specif part number, please include it with your message.